The Witcher 3: Hearts of Stone is the first of two expansion packs for The Witcher 3: Wild Hunt. The developer, CD Projekt Red, has already released a lot of free DLC for the game and the main game is one of the longest and most satisfying RPGs of 2015. So with all the free DLC and a girthy main game, is Hearts of Stone worth the price of entry? The story of Hearts of Stone is the best part of the expansion. It is wonderful. I can’t tell you much because I don’t want to spoil it, but I can tell you it is worth buying the expansion just to experience the story. The Witcher 3’s story was always at its best when it focused on the individuals that made up its world. While the semi-apocalyptic nature of the main tale was serviceable, the unique and fascinating characters are what makes the game’s setting a world you can get lost in. Hearts of Stone is wise to tell a narrative that is focused on a few individuals, and the result is a tale full of heart and depth. Hearts of Stone places Geralt in situations that we did not see in the main game. 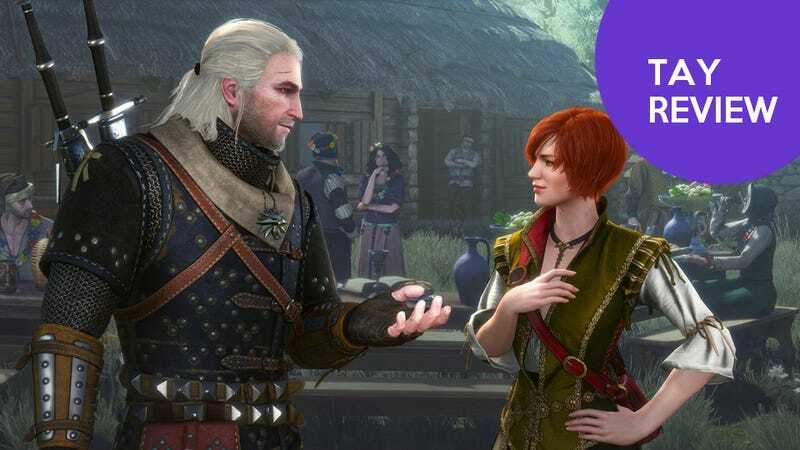 Seeing Geralt negotiate hostage situations, attempt to party at a wedding, and deal with the problems of sadness and lack of companionship are just a few highlights of the expansion. The expansion introduces plenty of new characters, such as the delightful Von Everec family, in addition to reintroducing old ones, such as Shani (from the first Witcher game) and Gaunter O’Dimm. These characters are handled wonderfully and they are all given deep multi-faceted personalities. One character starts off as what seems like comedic relief, but later we see his hopes, fears, and insecurities. The character’s featured in Hearts of Stone are some of the most memorable in the entire Witcher series: the game makes them seem real and flawed, I will miss them if I do not see them in the next expansion. Aiding the great script are wonderful animations and voice work. The actor’s inhabit these characters and deliver their lines in a way that drew me in far more than I expected. The Witcher 3 had fine voice work, but at times it could lean towards the histrionic. Hearts of Stone seems far more intimate than theatric. Hearts of Stone is driven by strong themes and interactions between the characters. It isn’t the apocalyptic story of most RPGs. This is a good thing. Most players will have played that kind of story in the Wild Hunt already and at least for me, I felt tired and didn’t want to save the world again so soon. Hearts of Stone recognizes that and instead of giving me an apocalypse to stop it shows the player some people who need Geralt’s help for various reasons. It drew me in with familiar faces and new friends and rivals. The story allowed for a different side of Geralt to shine through. Hearts of Stone compliments the main game’s story by being a different beast and it could stand all on its own as one of my favorite Witcher stories in any media. Hearts of Stone’s missions are some of the most enjoyable and special of the whole game. Don’t expect anything revolutionary though, they are not radically different than the missions we have seen Geralt in before. These missions instead match up with the most memorable missions of the series using familiar mechanics in new ways. The missions distill what is great about the Witcher 3 while also having some rewarding callbacks to past games for series diehards. For example, there is one mission involving a wedding. There, the game highlights all of the Witcher 3’s non-combative moments in one area and mission with a storyline that is enchanting and humorous. There is gwent, conversation, detective work, and more. As the missions highlight what was great about the Wild Hunt they also allow new sides of Geralt to be shown. Like the rest of this DLC, it’s a really nice combination of new and old. The DLC is made up of five main missions: an intro, conclusion, and three in the middle. The three missions in the middle are all lengthy meaty missions that vary in tone and content. These missions are all wonderful and they are all very different. Completing the main storyline of the DLC will take from 5-8 hours, depending on how fast you move through it. There is a lot to see and taking your time will reward you in these missions. Aside from that there are a few sidequests that are par for the course for The Witcher sidequests: they are short but have a few hidden gems in them that will stay with you. There are a few treasure hunts as well if you need some better gear, as well as a few new gwent cards. My playthrough took me about 12 hours, but I spent a while crafting and looking for ingredients, so your mileage may vary. I was really pleased with my time in Hearts of Stone. I felt satisfied when i finished up. The new enemies they added in Hearts of Stone are wonderful. For instance, fighting the Sand Mage is completely different from any enemy in the base game. In many of the fights I felt challenged and died a bit. This was refreshing because by the end of Wild Hunt I felt like I had to increase the difficulty. The new enemies aren’t tough because they are full of hit points or Geralt’s attacks don’t hurt them, but because they require new strategies to take them down. It made me feel like a witcher, rather than just a spellsword, using the monsters’ own weaknesses against them. The boss fights were equally gratifying for the most part. If you buy DLC for new items, assets, or radically different mechanics, than Hearts of Stone isn’t for you. There are some new items and a handful of new minor locations, but all of these look and feel very much like The Witcher 3. If the base game didn’t knock your socks off, then the DLC certainly won’t. Hearts of Stone takes the best of what the developers did during the base game and crafts a new storyline from those parts, and it is wonderful, but for some that may not be enough. The game encourages you to explore a section of the map that players probably didn’t spend too much time in during the Wild Hunt, but there are not really any new spaces to explore in this DLC. This wasn’t a problem for me because I enjoyed the storyline and new monsters so much, but I do understand those who may be disappointed we did not get to see more of the world of the Witcher series. My main complaint is that there wasn’t enough new gwent cards! I got sucked into the card game and wanted more. Those of you who have played the Witcher games know how the games love bringing back old characters and showing players how their decisions have affected the world and its inhabitants. Things that happened in the first or second game were often mentioned or expanded upon in the third one. Even in the Wild Hunt, when you completed a quest it likely had an impact that you would see hours later in play. However, Hearts of Stone is the second to last piece of Witcher video game content we may ever see. The developers have said they are done with The Witcher after this next piece of DLC and that they are not planning on doing another Witcher game at the moment. I personally think there will be another game down the line, but not for a very long time. So while the storyline of Hearts of Stone concludes admirably, we won’t likely be able to see how are decisions play out in the long term. This isn’t a huge deal, but The Witcher has made a big deal of your decisions having an impact in the past, so I thought I would mention it. When I had finished The Witcher 3: Wild Hunt I was satisfied. I felt like I’d had my fill of Geralt and was ready to leave his world behind. Hearts of Stone changed that. It reignited my love of the game and has me looking forward to the future expansion. I wholeheartedly recommend Hearts of stone.